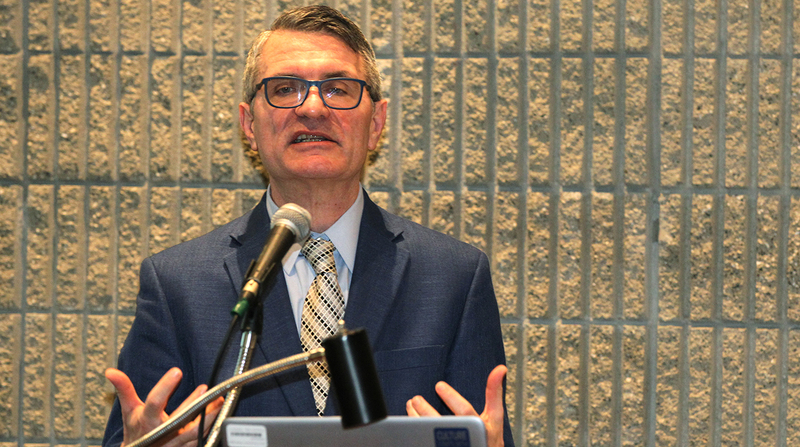 ATLANTA — Upcoming regulations are expected to call for reducing simultaneously carbon dioxide and nitrogen-oxide emissions — prompting new engine components and processes, including hybrid-electric powertrains, an executive with Eaton Vehicle Group said. “We just came off a long, enforced march to reduce NOx and thought that was the end of it. But it’s not,” Mihai Dorobantu, director of technology planning and government affairs, said at American Trucking Associations’ Technology & Maintenance Council 2019 annual meeting here. Regulators in California and the U.S. Environmental Protection Agency, according to reports, are eyeing a 90% reduction in the limit on NOx compounds — down to 0.02 gram per brake horsepower-hour from the current ceiling of 0.2 gram, the limit since January 2010. NOx produces smog and ground level ozone. Reduced greenhouse gas emissions are on tap, too. Burning diesel fuel results in CO2 emissions. The GHG Phase 2 final rule, issued in June 2016, calls for lowering truck emissions of carbon dioxide and other greenhouse gases in 2021, 2024 and 2027, but it left in place the earlier limit on emissions of nitrogen oxide at 0.2 gram standard. The California Air Resources Board noted selective catalytic reduction systems, used to convert NOx using diesel exhaust fluid, are near the limits. To achieve both reductions at the same time will require the deep integration of modular and smart components plus flexible solutions, Dorobantu said. Eaton is addressing engine air management with modular variable valve actuation to allow better control of combustion and better regulation of emissions. At the same time, Eaton’s electric TVS exhaust gas recirculation pump allows the turbocharger to operate more efficiently and better control EGR. It offers about a 5% improvement in fuel efficiency, according to the Dublin-based company. Its hydraulic lash adjuster is intended to ensure precise valve seating and optimize engine air flow and fuel management, Dorobantu said. Meanwhile, Eaton’s eMobility segment has three primary areas of focus for automotive and commercial vehicle customers — intelligent power electronics, power systems and advanced power distribution and circuit protection. These include 48-volt mild hybrid systems that drive the heating, ventilation and air conditioning system and replaces the alternator to charge the battery. Another means is electric vehicle transmissions, including two-speed and four-speed models to tailor the behavior of the motor for specific applications. UPS Inc. said it operates nearly 700 hybrid electric vehicles. UPS ranks No. 1 on the Transport Topics Top 100 list of the largest for-hire fleets in North America. UPS has pledged to obtain 25% of the electricity it consumes from renewable energy sources by 2025 and replace 40% of all ground fuel with sources other than conventional gasoline and diesel, an increase from 19.6% in 2016, according to the Atlanta-based company. Transportation accounts for 30% of energy use, and Class 8 longhaul trucks burn about 7% of the national energy production, most of it in the form of petroleum products. As for hydrogen-electric trucks — the industry is far from hydrogen infrastructure and distribution network. But the related technology in the truck — fuel cells and electric motors — exist today, he said.